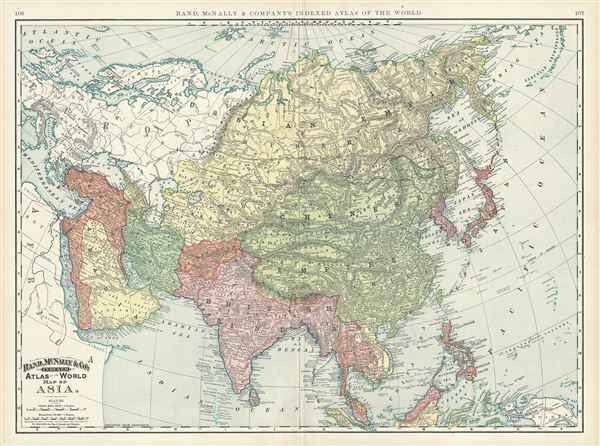 This is a beautiful example of Rand McNally and Company's 1892 map of Asia. It covers from the Arctic Ocean south as far as Sumatra and from the Arabian Peninsula and Turkey eastward as far as Kamchatka, Japan, the Philippines and New Guinea. It includes the empires of Hindoostan (India), China (includes Tibet), Toorkistan, Persia (Iran), Cabool, Beloochistan (Afghanistan), Birma (Burma / Myanmar), Siam (Thailand), Anam (Vietnam), Malaysia, Japan, etc. Tibet is included within the borders of the Chinese empire. The Great Wall and the Imperial Canal are both identified. The disputed body of water between Korea and Japan is here identified as the Japan Sea. The map notes the route of the Trans-Siberian railroad. As this map was being drawn, Imperial China wilted under the weak Qing Dynasty while the Russian empire attained the height of its pan-continental expansion. It was at the time, under the more peaceful rule of Alexander III, who, after the assassination of his father, the more liberal, Tzar Alexander II, took over the reign of the empire. Japan was witnessing a transformation of its feudalistic society into a modernized nation but would soon engage in the First Sino-Japanese War for control over Korea and Taiwan. Meanwhile, Turkey and the Middle east were under declining Ottoman rule while the British Raj governed of India. Color coded according to countries and territories, the map notes several towns, cities, rivers, mountains, and various other topographical details with relief shown by hachure. This map was issued as plate nos. 106 and 107 in the 1895 issue of Rand McNally and Company's Indexed Atlas of the World - possibly the finest atlas Rand McNally ever issued. Rumsey 3565.028 (1897 edition). Philip (atlases) 1026 (1898 edition).